A Friendship song sung, composed and written by Madhuri Murli featuring her in song video. The video of this song is available on YouTube at the channel Madhuri Murli. This video is of 4 minutes 08 seconds duration. 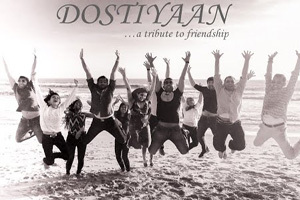 Lyrics of "Dostiyaan (A Tribute To Friendship)"
Lyrics in Hindi (Unicode) of "दोस्तिया (अ ट्रिब्यूट टू फ्रेंडशिप)"